There is a wonder and magic to childhood. We don't realize it at the time, of course...yet the adults in our lives do. They encourage us to see things in the stars, to find joy in colors and laughter as we play. But what happens when that special someone who encourages such a wonder and magic is no longer around? We can hide, we can place our heart in a bottle and grow up...or we can find another special someone who understands the magic. And we can encourage them to see things in the stars, find joy among colors and laughter as they play. Robot's Review: The first book I read from Oliver Jeffers was The Book Eating Boy. That one I absolutely LOVED! This one was different, but I still liked it. The Book Eating Boy was funny and so I think I set myself up thinking this book would be similar. But, The Heart and the Bottle is rather serious. Well, we still had fun reading it because of the pictures. Jeffers is a fantastic illustrator. 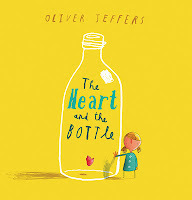 The Heart and the Bottle is about a girl who's father died and it breaks her heart. At least that's how I saw it. And it takes her a while to heal. And she is ready to put her heart back in its place but doesn't know how to get it out and needs help. Though it was a nice book, it seemed a little sad to be reading. I don't know if it's a great bedtime read. A bit depressing. Even though it turns out well, it's still sad. Maybe it's a good book for those who are grieving the death of a loved one. The kids enjoyed the illustrations too though. I would like to continue reading more of Oliver Jeffers books. Midnite's Review: The thing I love about Jeffers is that he can deliver a deep message with such simple imagery and words. Like Robot said, this one delivers a punch to the heart...but it also gives hope. The girl's heart breaks so she locks it up. And while she doesn't feel pain anymore, it comes with a price: emptiness. Eventually it is but a child that teaches her to hope again. I love the symbolism here. While it may not be a typical "bedtime" story, it's still worth sharing. And it is sad. Because what's more heartbreaking than losing a loved one. And we will all lose someone at some point. C.S. Lewis once said, "We read to know we are not alone." With this, I know I'm not alone. Book available on amazon.com here.